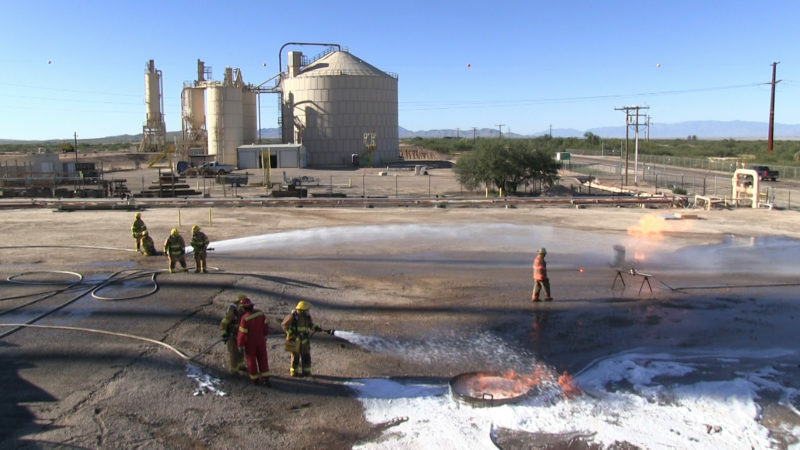 (Cochise, AZ) From facing down fires to treating injuries, the members of the Emergency Response Team at Apache Generating Station (AGS) know that being prepared is the first and best line of defense. Putting those skills to the test recently was critical to that mission. The Emergency Response Team practices handling hoses and extinguishing a variety of blazes. “Every opportunity we get, it’s valuable to make sure that when we’re called upon, we’re efficient and that we’re effect,” said Buck Taylor, safety specialist for generation for Arizona Generation and Transmission Cooperatives (AzGT). Every year, American Emergency Response Training (AERT) visits AGS to review the team’s emergency response tactics and provide feedback. 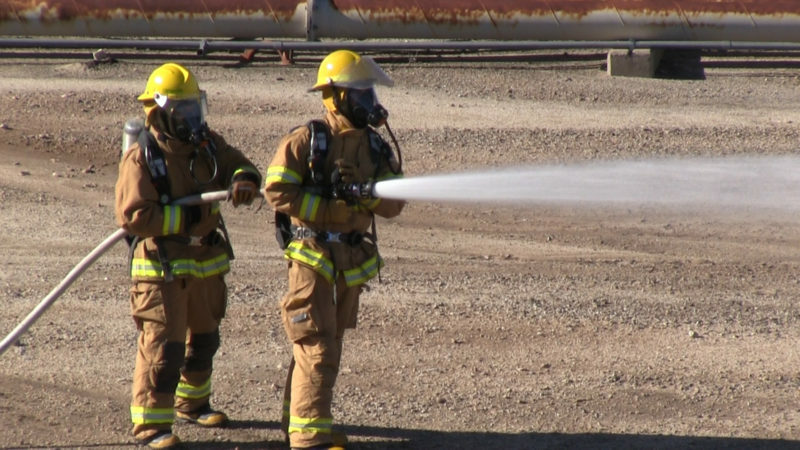 For the training to fight fires, AERT set up gas lines with valves and put the team through its paces from suiting up to operating the fire truck and handling the hoses to extinguish a variety of possible blazes. Handling a fire hose at full blast requires team work and skill. “This is a pretty veteran team here, and I would say that they are one of the better teams that we work with in terms of experience and the amount of knowledge base that these folks have,” said Shane Snyder, lead instructor for AERT. Should an employee ever be injured severely enough to need medical attention at a hospital, time will be of the essence. 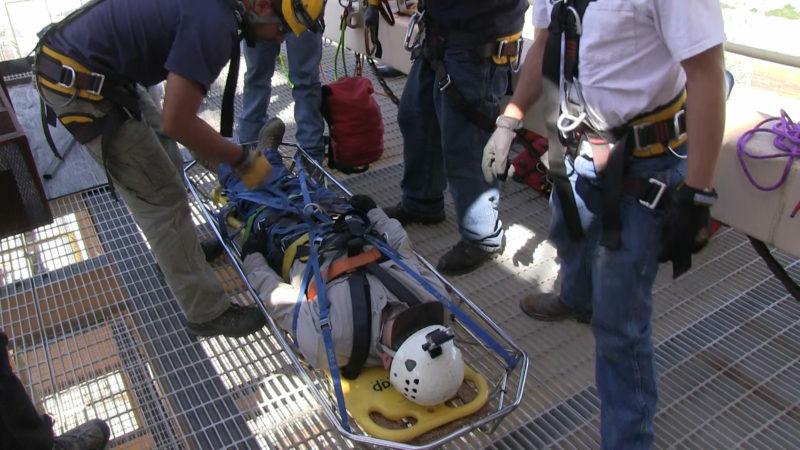 A technical rope rescue could be necessary if the employee is on an elevated level within the facility. 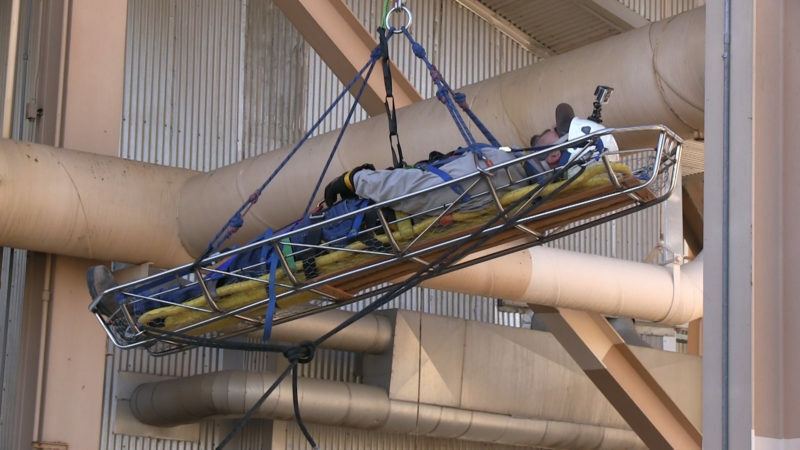 To address such a situation, the team practiced a technical rope rescue by placing one of their own, Tyler Clemson, in a basket and lowering him from the top level of Steam Unit 1. Tyler Clemson is loaded into a basket for the team to practice a technical rope rescue off of Steam Unit 1. “I think it’s important for each emergency responder to experience what it’s like to be in certain types of rescue devices so that in the event they are packaging and moving somebody, in a technical rescue environment, they can appreciate more about what that person is going to experience as they’re being moved in that environment,” Snyder said. Clemson is lowered from the highest level of ST1. A trained team will also know the layout of the facility and what areas to avoid or to enter should a real emergency occur. When a local fire department or medical professionals arrive, the team can then assist those responders with better information about the situation and how to navigate the facility. 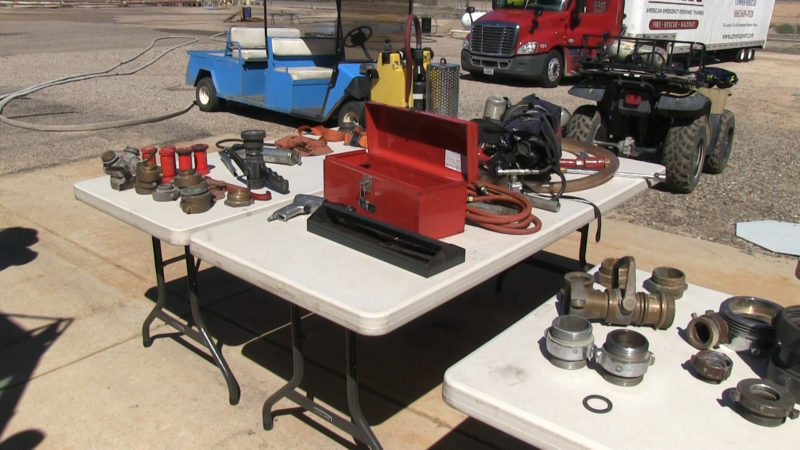 The drills keep the team familiar with all of the equipment they must use, such as the variety of connectors and nozzles used for firefighting.